Journalists in different media houses have been shifting lately as power struggles between top media companies has intensified. Citizen TV has been poaching a bunch of presenters lately from other TV stations but also has lost a few of their top guys in the process. Citizen TV and NTV have now released their official news lineup both on the same day leaving Kenyans arguing on which side they belong. 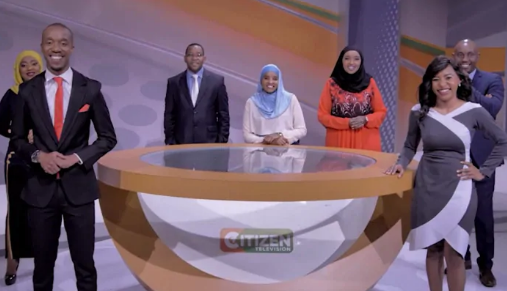 Ex-NTV news anchors Nimrod Tabu, Jamila Mohamed, Lulu Hassan’s hubby Rashid Abdhalla, former KTN Swahili news anchor Mwashirima Kapombe Swaleh Mdoe, Mwanahamisi Hamadi and the ever glowing Lulu Hassan made up the line up for Citizen TV. NTV on the other hand has Salim Swaleh, Doreen Gatwiri, Nuru Abdulaziz as well as Kaltun Jama on their Swahili desk.